Yeah, I know – this movie also stars Jane Fonda. So if you're among those who hate Fonda and will never watch anything she's in, then that's your right and so go ahead and skip this too. All I'll say is that, in this case, you're cheating yourself of a pretty darn movie. I'll add that I myself share few if any of Fonda's views, especially her antics during the Vietnam War years, but am able to separate that from enjoying some of the movies she's been in. This is, very simply, the story of a cowboy (a modern-day one) who has lost his way via fame and booze and manages to find his way back with the help of a twelve million dollar horse who has been drawn into a similar situation. Robert Redford is the cowboy, Sonny Steele, a 5-time All-Around rodeo champ who these days, too bent and beat up to continue competing, serves as the “face” for a top-selling cereal product that is part of a big bucks business conglomerate on the brink of a very important merger to grow even bigger. The horse is Rising Star, a thoroughbred racing champion, now owned by the same outfit and serving as the symbol for their future expansion. Both Sonny and Rising Star are in Las Vegas as part of a promotional extravaganza that will culminate in the finalizing of the merger. Upon examining Star, however, in preparation for riding him during an on-stage production planned as a highlight of the promotion, Sonny discovers the horse is doped to the gills and even has an injured leg that is not being splinted properly because it wouldn't “look good”. When he tries to bring this to the attention of the head honcho of the company, he is rudely blown off. And when no one else will listen to him either, the cowboy decides to take matters into his own hands. 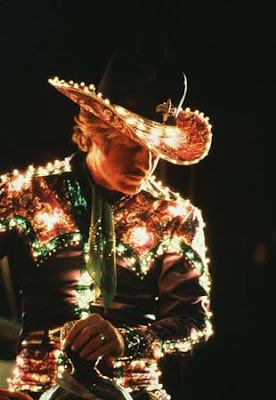 At the height of the big stage show, astride Rising Star and all decked out in strings of electric lights fed off a battery pack, Sonny rides off the stage, out through the casino crowd and onto the Vegas Strip, then gallops away into the Nevada desert. From there it's a game of cat-and-mouse. 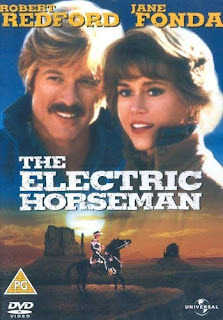 Sonny and Star on the run -- trying to keep from being discovered as they work their way toward a remote location where Sonny plans to set the horse free after he's purged the drugs from his system and healed his leg – and all the forces of the law and big money influence trying to intercept and stop them. Only a savvy TV newswoman named Hallie (Fonda) manages to figure out what Sonny has in mind and manages to chase him down. Hearing his side of things, Hallie convinces Sonny to let her record what he has to say so she can get it played on the air and present to the public that he's more than just a crazy, drunken horse thief. A (somewhat illogical) romance blossoms between the two and, from there, Hallie sticks with Sonny to help him try to free Rising Star. It helps that her tape of what Sonny had to say starts to sway the public and the business conglomerate that owns the horse has to go into spin mode to try and convince everybody that they've only wanted what's best for Rising Star all along. Ah, yes. My heroes have always been cowboys. This is not a movie I'd stand in line around the block to see. But it's pretty good. A little different, enjoyable, well done. I liked it when I saw it at the theater almost forty years ago, I still did when I re-watched it on cable recently. Check it out if you get the chance, I think you might, too.